You know change is hard. But did you know that the ability to adapt to change is the No. 1 success factor for leaders? But what do you need to do to adapt and respond well to change? A new CCL guidebook, Adapting to Organizational Change, distills the knowledge and best practices that will help you flex and adjust during changing times. The first thing you need to do to manage change and be adaptable is understand there is a difference between change and transition. Change is defined as the situations and occurrences that impact organizations and individuals, such as a new boss, a move to another location or a shift in policy. Change creates the need to move from the way it used to be to the way it is now. Transition is the internal psychological process of adapting to a new situation. Transition can happen quickly or slowly. It is the process of moving successfully from the old to the new. Another key strategy is to identify how the changes affect your feelings and thoughts. For many leaders, change challenges their experience with being right or in control. Feelings of anger, fear, powerlessness or frustration, as well as being stressed and exhausted, are common. But if left unresolved, negative feelings and thoughts become more intense, which can lead otherwise successful people to derail. Learn all you can about the nature of the change without first judging it. Take stock of who is losing what. Define the precise details of what is over and what is not. Admit to yourself and others that the change has occurred. Actively seek information from all relevant sources about the change. Let others know the facts and feelings that you have about the change. Mark the ending in a meaningful way. Take note of what has been lost and what has been gained. Realize that uncertainty is an integral stage between an ending and a new beginning. Don’t expect to know everything or to be perfect. Set short-term goals to move through uncertainty and advance toward a new beginning. Take stock of what you need to accomplish those goals and identify opportunities that will help you move forward. Look backward to the ending and acknowledge what you had. Look forward to the beginning and the possibilities it could create. Connect to your values. When you feel uncertain and confused, your personal values provide direction. Imagine what the new beginning looks and feels like. Symbolize the new beginning in words, images and thoughts. Give everyone a part in the new beginning; find a place for all relevant parties to the change. Create strategies for tackling new problems and meeting new challenges. Re-emphasize the reason for the change and recognize that reason as why you are beginning anew. Find ways to mark your success. People experience organizational change in many different ways and the process of transition will vary. As a leader, you must deal with your own personal uncertainty and resistance to change. Recognize that your process of going through endings, neutral zones and new beginnings will affect your work and the people around you. With greater awareness of the human side of transition, you will be more adaptable — and able to help others adapt to change as well. 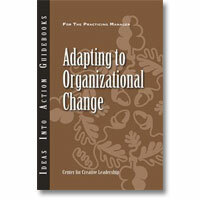 This article is based on Adapting to Organizational Change, a new guidebook from CCL.